25 lb box of Waffle and Pancake mix is ideal for food service. Serve delicious waffles and pancakes that are certified gluten-free, for a worry-free experience for your guests. 7" Waffle Recipe: Preheat waffle iron to medium heat. Combine 1 1/4 cup Bosquet Buttermilk Waffle mix with 1 1/2 cup water in a bowl and thoroughly mix until smooth. Lightly grease waffle iron and add batter, filling iron 3/4 full. Cook until golden brown, about 2-3 minutes. Pancake Recipe: Preheat baking griddle. Combine 1 3/4 cup Bosquet Buttermilk Waffle mix and 1 cup milk in a bowl and mix thoroughly until batter is smooth. Lightly grease griddle; pour batter onto griddle (approximately 5 inches). Flip pancake when mix begins to bubble. Remove pancake from griddle when both sides are golden brown. Makes approximately 5 5" pancakes. Certified Gluten-Free by the Gluten-Free Certification Program and produced in a 100% Gluten-Free facility. * TM Trademark of the National Foundation for Celiac Awareness. Used under license. 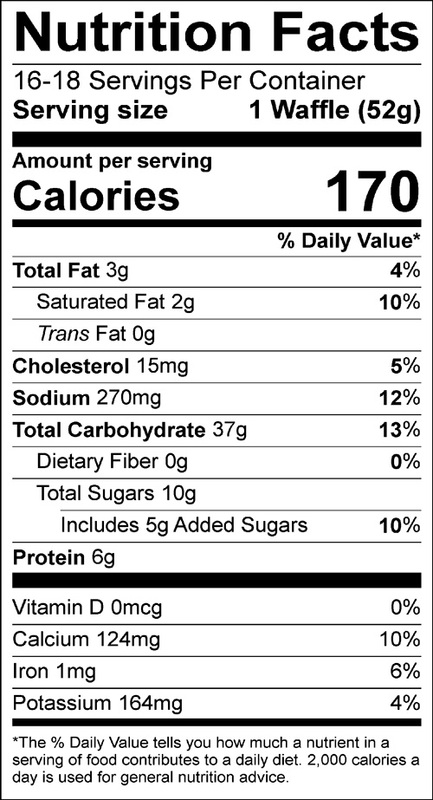 INGREDIENTS: BROWN RICE FLOUR, BUTTERMILK POWDER, SUGAR, TAPIOCA STARCH, UNSALTED BUTTER POWDER, ARROWROOT STARCH, EGG REPLACER (TAPIOCA STARCH, ARROWROOT STARCH, CITRUS FIBER, CREAM OF TARTAR, SODIUM BICARBONATE), CONTAINS LESS THAN 2% OF BAKING SODA, NATURAL AND ARTIFICIAL FLAVOR, SALT. This product was manufactured in our gluten-free facility that has undergone an independent third-party audit to verify our ability to meet the GFCP (Gluten-Free Certification Program) requirements for producing gluten-free products. 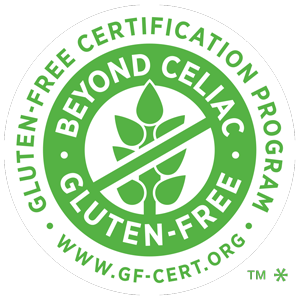 The GFCP is endorsed by Beyond Celiac and is a food safety-based gluten management system for manufacturers. Our mixes have been laboratory tested and proven to be gluten-free. Aii, Inc., an SQF (Safe Quality Food) certified facility guaranteeing both food safety and quality. We operate under the highest of industry standards provide safe and reliable products.